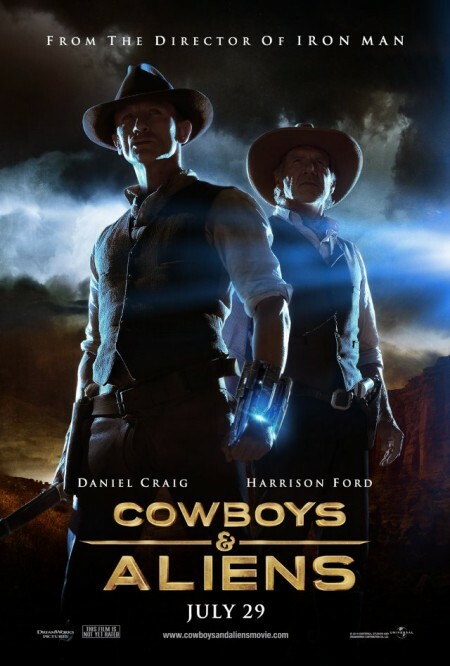 A film with a title like Cowboys and Aliens you have to hope does what it says on the tin. Cowboys and Aliens does just that and not a lot more so it comes down to if that’s enough for you or not. The reverse of last weeks The Guard was true of this film: The Guard had no early hype in fact I don’t remember seeing an advert for it or a film trailer. Cowboys and Aliens had loads. The Guard had good reviews and this didn’t. Yet I enjoyed this as much possibly because I wasn’t expecting as much. Cowboys and Aliens borrows a fair number of its moments from generic westerns rather than taking the Back to the Future III route of name checking them. Daniel Craig is a variation on the archetypal stranger in that other people know or deduce who he is while he has amnesia. Harrison Ford’s ex-soldier cattle baron is bad but only for long enough to be redeemed. The supporting cast of locals are developed enough to be identifiable and interesting which is important given some will be abducted and the survivors will make up the posse who ride out to save them. The aliens could probably have been more interesting. Initially only revealed with shadows, a footprint and some drops of blood revelation of one of them possibly came a little early in the film. After that the film escalated from being Alien to Aliens with hordes of them being dispatched in later scenes. The plot is basically logical at least in structure. It’s also pretty simple and straightforward – it’s not a J.J. Abrams production it’s a homage to classic westerns with aliens. Yes it does require the watcher to accept that the aliens need to abduct humans to learn our weaknesses and that they came to Earth because gold is very rare and precious to them. Then most alien invasion films and The Matrix had similarly tenuous or worse plot devices. At least there be gold in that there planet fits with Cowboys and Aliens. In the end Cowboys and Aliens is a fun, silly high concept summer blockbuster that it doesn’t pay dividends to thing too hard about. It does what it says on the tins.